Goat-cheese is one of those words that get my attention every time. Goat cheese has an enchanting flavor in its creamy frame. Add it to salads, vegetables, muffins, breads and you have made a good dish - a great dish. I have a bunch of goat cheese recipes to try and I started with this one from Bev Cooks. I added about a teaspoon of smoked salmon to each muffin, cut into small pieces for extra taste. I used gluten-free flour and skipped the rosemary and used herbs de provence. This was easy to do and took little time. It basically is mixing everything (except the goat cheese)after chopping the onion. This is my kind of cooking. 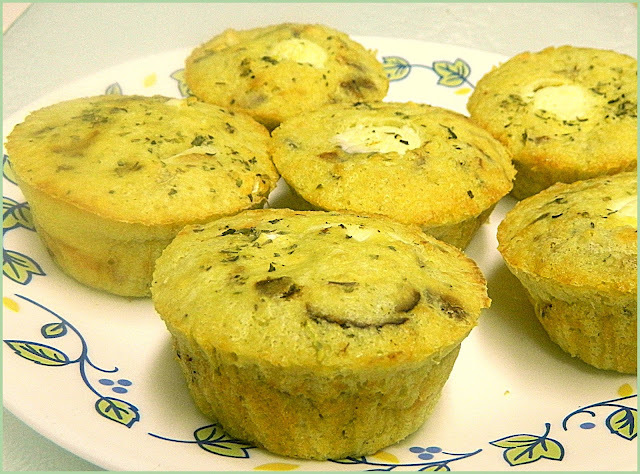 Coat a muffin tin with cooking spray and set aside. Melt the butter in a small skillet over medium high. Add the onions and sauté until soft, 4 minutes. In a large bowl, sift together the flour, baking powder and salt. In a smaller bowl, whisk together the egg, milk and Greek yogurt. Pour wet ingredients into the dry ingredients and gently fold to mix. Do not over mix. Add the onions to the bowl; lightly fold them into the mixture. Spoon the batter into 5 muffin tins. Place spoonfuls of the goat cheese into the batter. Bake for 20 minutes, or until golden brown.